Next day at the Daily planet. I'm extremely confused by what's going on, both in this story but also with Superman in current DC in general. Is it that the nu52 Superman died, but the OLD Superman/Clark (who's married with Lois and has a kid) inexplicably survived Flashpoint and got dropped off during Rebirth, essentially filling his old/new selfs shoes? And that would mean this is the new/old Lois (the one married to pre-nu52 Superman), but she's investigating a "new" new Clark, who isn't the nu52 Clark but an entirely new one who somehow also works at the Daily Planet and has knowledge of the "old" new way of living, given he isn't dating Lois (or Wonder Woman for that matter)??? I think your first paragraph is right. IIRC, Lois Lane in this current universe became Superwoman (along with Lana I think, like Electric Superman Red and Blue, sorta), but then Lois died on her first adventure. So I think post-Crisis Clark and Lois are now pretending to be the current ones to the public. But Clark revealed himself to the heroes and the public as Superman, but they don't trust him. And Chris is with them. Yeah, didn't nu52 Lois reveal Superman's Secret ID to the world, so wouldn't the new post-crisis Lois and Clark, who still look like and are called Lois and Clark, also be inadvertantly revealed? So how can even this "mysterious" Clark still walk around and be without his landlord unrecognised if Superman is exposed? Nu52 Lois revealed nu52 Clark to be Superman to prevent Superman from being blackmailed by someone/something. But he still took it as betrayal. I think they made up since before they both died. I think the comics have shown that some of their friends and colleagues feel like post-Crisis Lois and Clark feel a bit off. They both realize the biggest problem is Chris showing up all of a sudden. I think they used the adoption excuse. I don't know why people don't know who Clark is. Comics?!?! "didn't nu52 Lois reveal Superman's Secret ID to the world, so wouldn't the new post-crisis Lois and Clark, who still look like and are called Lois and Clark, also be inadvertantly revealed?" Aside from the fact that, at the time, Clark was in hiding: no. because Lois Lane outed Clark Kent, a journalist who works at the Daily Bugle and who lives in Metropolis and who is in his twenty. he had nothing to do with Clark Smith, who lives in a farm with his wife and son and who is well into his 30s-40s. "So how can even this "mysterious" Clark still walk around and be without his landlord unrecognised if Superman is exposed?" because the public already questioned his identity when he appeared all of the sudden and they have, at the very least, accepted this is not Nu52 Superman nor Post_Crisis Superman. Thanks for clearing that up, I was unaware the 40 year old married Superman was using a different name and working at a different place. Although I'm still not entirely clear how the new Clark shown in this story is NOT thought of as Superman, given the public ID reveal is still canon. But I suppose another guy who just happens to be called Clark isn't the weirdest thing in the DC world. Superman is known to be dead, dead, dead. It's hard to claim he isn't when he crumbled to dust. 1) Lois was wrong (or lying as part of a plan that she, Superman, and Clark were involved with). This is where most people (including Mystery Clark, who made the latter claim) fall. not Rebirth. They arrived because of the events of Convergence and were introduced in Clark & Lois. THIS Clark Kent NOBODY knows who he is (because Nu52Superman had been outed before dying) but he claims Nu52Superman convinced him to swap places to protect N!Clark. According to him, Nu52Clark's life as... Clark... was HIS life but not Nu52Clark's life as Superman. When The Nu52 Superman died, he somehow gave Nu52Lois and Nu52Lana powers but Lois died because of them. Post-Crisis Lois is pretending to be Nu52 Lois for a number of reasons. Wait, Nu52 Lois is dead? Huh. well, i am not following Superwoman, but she supposedly died during the first or second issues. She may be dead or she may be "dead", either way she is no longer present and nobody but Clark, Lois and Lana know. It feels like no one responding has actually been reading Rebirth. 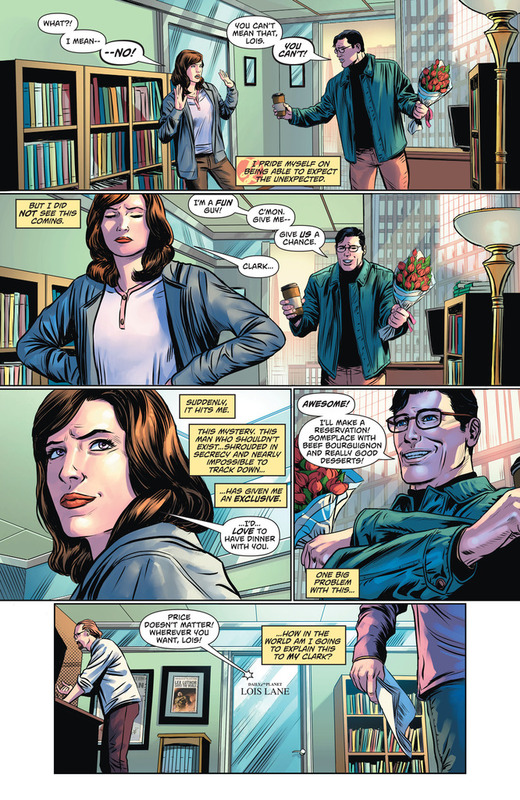 Clark and Lois came to the nu52 before Darkseid's original invasion of earth because of events in Convergence. During Convergence Lois had a child named Jonathan (not Chris). Clark and Lois were in hiding in the nu52 earth during these presumably 8-9 years since the original invasion as the White's. Clark attempted to save the earth in secret by removing villains and stopping events that he already had seen on his world before they happened on this new earth. Nu52 Superman had his identity exposed by nu52 Lois Lane. He then died and his power was transferred to Lana Lang, nu52 Lois Lane and Keenan Kong. Clark came out of hiding to become Superman again to protect the earth in lieu of the Superman of this earth. However it's been revealed that the nu52 earth is not a new earth at all, but is the pre-Flashpoint earth that was severely tampered with during the events of Flashpoint by (potentially) Dr. Manhattan and 10 years of the universe was removed and relationships taken away. A new mysterious Clark Kent appeared at the Daily Planet saying that he was the real Clark Kent and nu52 Superman had convinced him to go into hiding while Superman pretended to have his identity revealed as Clark Kent. Superman does not believe the new Clark Kent, as he knows better, but this Clark is human and believes itself to be telling the truth. They have both been in public together and there is a some belief in the public consensus that this Clark Kent is telling the truth (when he is obviously not). Nu52 Lois was transferred power by the nu52 Superman and subsequently dies in her first mission. 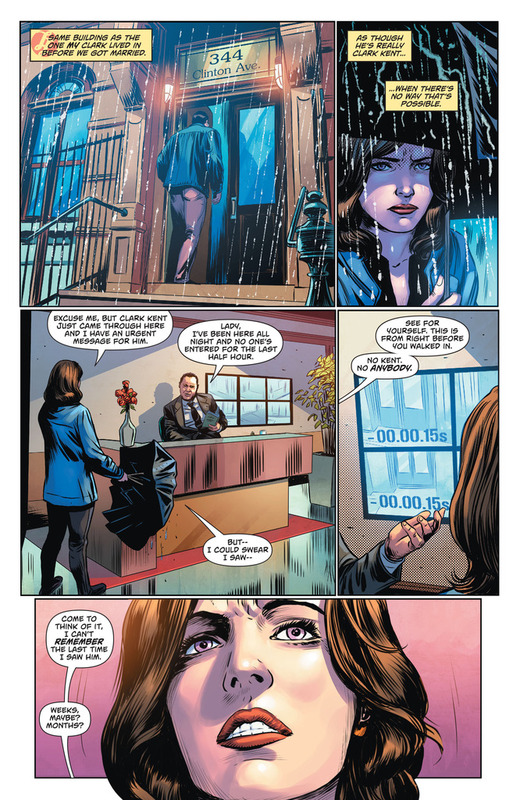 Pre-Flashpoint Lois receives a message from her asking her to continue her work and investigate a case for her. So Lois pretends to be nu52 Lois, even as she's at least 10 years older than her. the reason preNu52 superman and lois (and chris) survive is because they were picked up by Braniac during the Battle World (I think) event. ....there's literally an info dump one post above yours. Since New52 Lois and Clark are both dead, I don't think I'm following this, unless pre-Flashpoint Lois has just walked into New52 Lois' life and taken over, which is slightly weird. I'm sure there's a perfectly terrible reason for all of this. Lois had dreams of Nu52Lois trying to tell her something and went into the Bugle to try and find some answers. after beign confronted by Lana Lang as Superwoman, they decided to keep it on for the time being. This is twice you've done this, and it's making me twitchy. The Planet. The Daily Bugle is Spider-Man's paper, not Superman's. I've only skimmed random issues, but I think they said that Lois actually did step into her Nu52 doppelganger's life after NuLois went kablooey—she apparently had debated whether continuing NuLois' work would be honoring her memory or not. Guess people just think stress has made her look a bit older. The public Clark Kent is whoever popped up and revealed himself to be allegedly a separate person in the wake of NuSuperman's death. 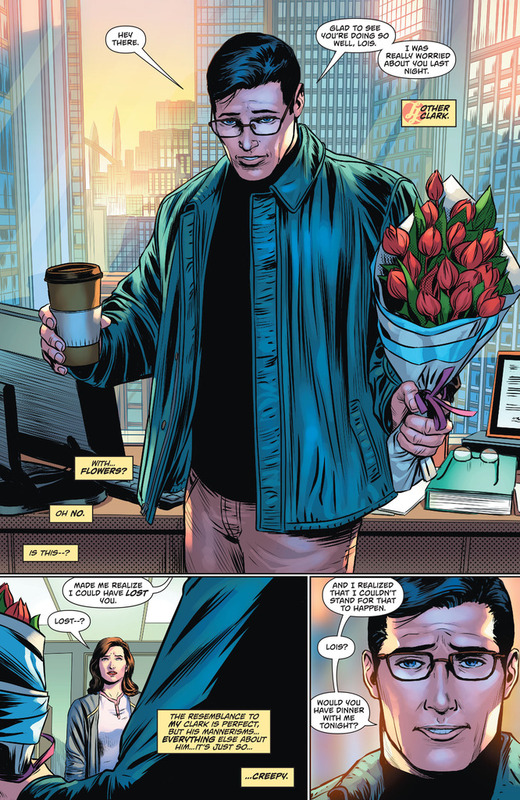 Post-Crisis Clark has appeared publicly as a new Superman, but I think he's still using the secret identity of Clark Smith and raising Jonathan on a farm in the Midwest (I guess super-speed flight makes it easy for the family to remain together despite Lois living on the East Coast). Pre-Flashpoint Lois just walked into Nu52Loi's life and taken over. That is exactly what happened. Local Lois figured out who she was and asked her to help her with a story, and since Local Lois has died, this is how Lois decided to do it. ...and yes it is very weird! Then a 3rd Clark Kent showed up after Nu52 Clark Kent died. Its got something to do with The Watchmen pin Batman found. that's actually what happened. this is pre flash point lois and pre flashpoint clark, and weird unexplainable clark. What's funny is I could swear this is an old Silver/Bronze age storyline - or two or three! - that they're mining. I can specifically recall covers where Superman is rescuing Clark from hanging off a window ledge and one wherein a hairy, bedraggled Clark that Superman has apparently been keeping prisoners exposes our Clark as Superman with an x-ray. I immediately thought it was good old Vann-Zee, the Kandorian double who we saw scans of a few posts back. But Vann-Zee was Kryptonian. That means it can't be Superman Prime either, thank goodness. I don't know why, but that seems gross to me. But Vann-Zee certainly fits the 'creepy' mode. Another one is the Flashpoint Clark. 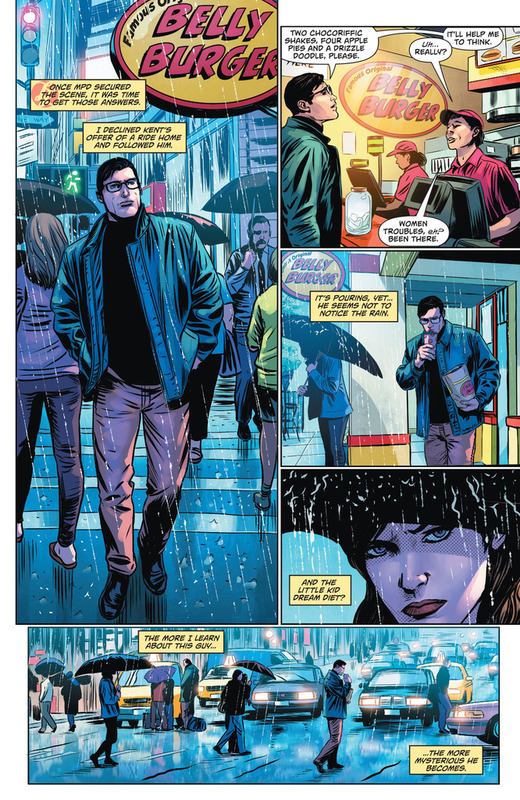 In Convergence, he was stalker-ish for this Lois. This is making Matrix Supergirl look clear and understandable. They're all robots. That's it. My pet theory is that when Power Girl was folded into the Supergirl character from the post-Crisis Earth 2, her Schrödinger's origin went zinging loose and started generating paradoxes in the pasts of other characters from the Superman family. It may yet prove the key to stopping Dr. Manhattan by retconning him into a version of Billy Crudup who doesn't want to appear blue and naked in a Zack Snyder film. At least DC isn't giving up on making stories that'll be *fun* to explain ten years from now when it gets mentioned in passing in another story and your new-to-comic friends go "huh? ".